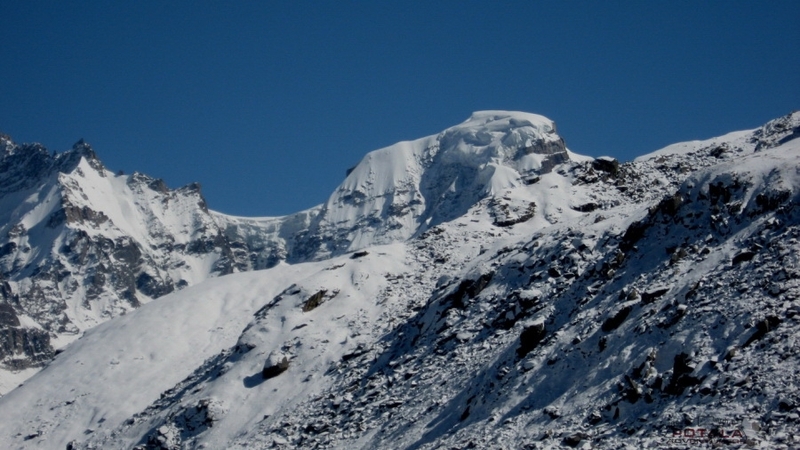 The elegant Deo Tibba 6001 m, situated southeast of Manali town and above Jagatsukh village on the Pir Panjal range of Himalaya. 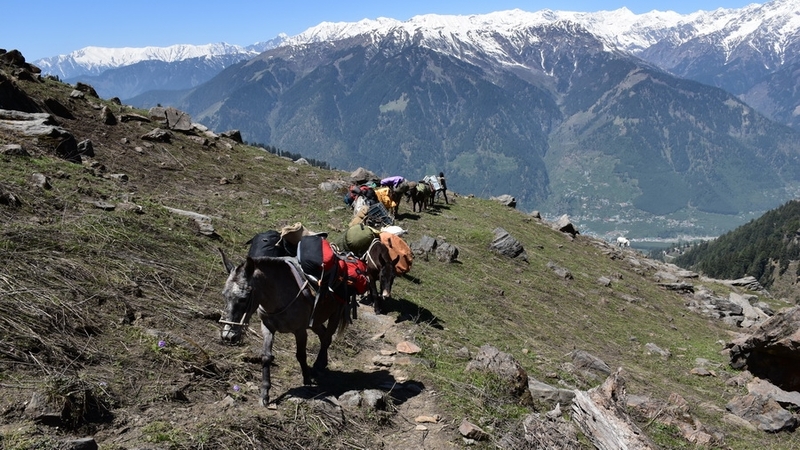 A comfortable trek, the route is full of panoramic views along thick forest and alpine plateau to the Piang Neru base of Deo Tibba (West Face). 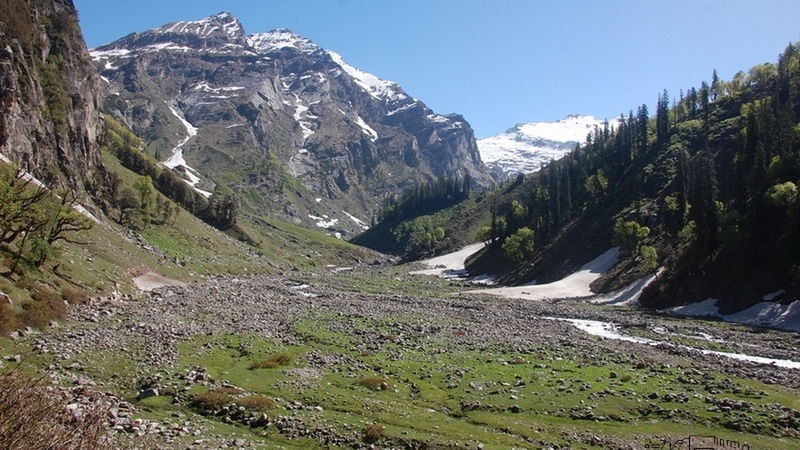 Piang Neru Nala or Jobri nallah is a principal tributary of the Hamta nallah. 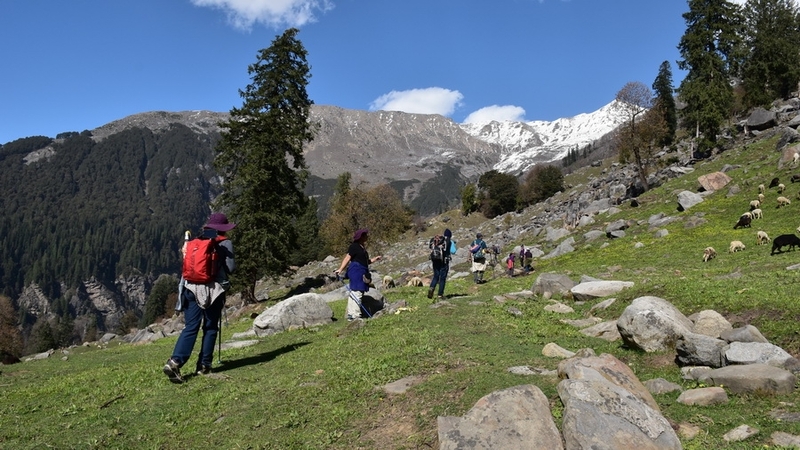 From Jagatsukh we follow one of the best alpine walks with an untiring gradient to Sarotu Thach (Thach – meadow) and Raudi Khodi. 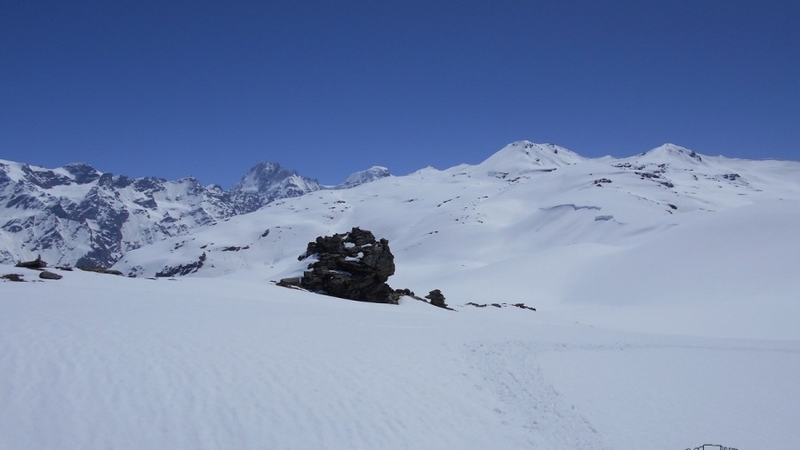 Crossing wonderful alpine plateau a breath-taking view of Deo Tibba appears with magical suddenness. Piang Neru at about 12000 feet where lateral moraines of the PiangNeru glacier comes to an end. 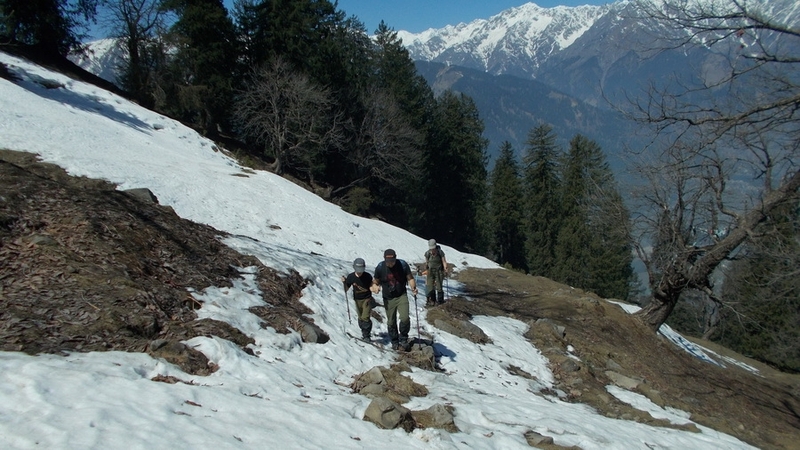 Finally easy descent to Chikka at Hamta nallah and along the rock wall to Chichoga heights to Chadiyari village. 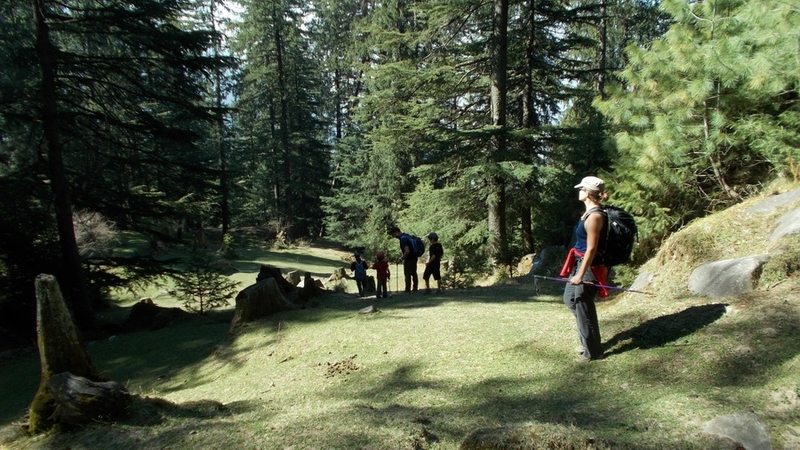 Day 1 - Manali, Drive Jagatsukh 1850m - Banara 2100 m, 9 km Trek Tilgan 2600m - Satoru Thach 2980m. Day 4 - Trek to Rahni Thach - Chichoga 2000m, Drive Manali. Day 1 - Manali, Drive Jagatsukh 1850m, 6 km. Trek to Tilgan 2600m - Sarotu 2980m, 6-7 hrs. Day 3 - Trek to Chikka - Jobri 2800m, 6 hrs. Drive Manali 1 hr. 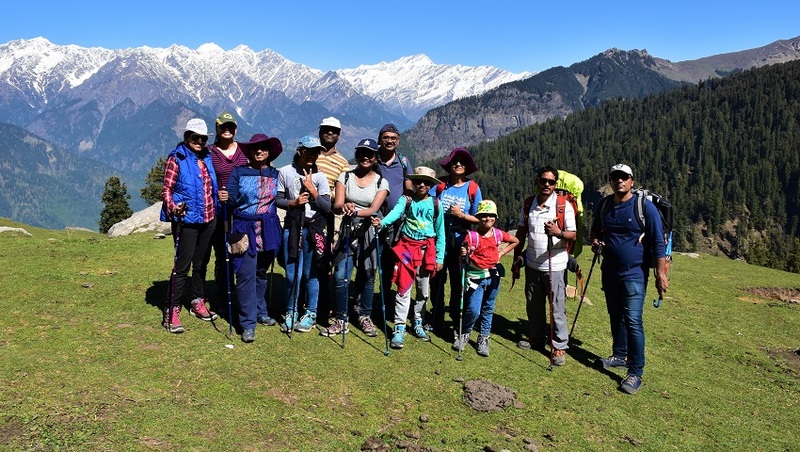 Day 1: Manali 1950m, drive to Jagatsukh (1850m) - Banara (2100m) 9 km, 45 minutes, Trek to Tilgan (2600m) - Sarotu (2980m), 6-7 hrs. 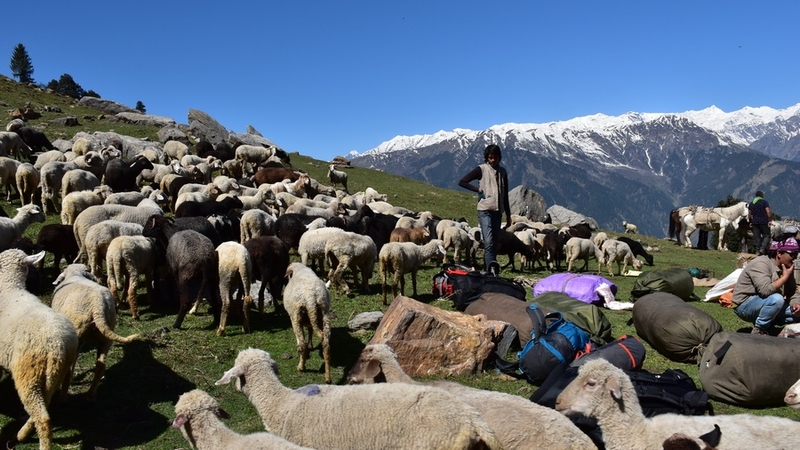 Today after breakfast we drive to Jagatsukh village situated at the distance of 6 km south of Manali on the left banks of Beas river on Manali – Naggar left bank route. 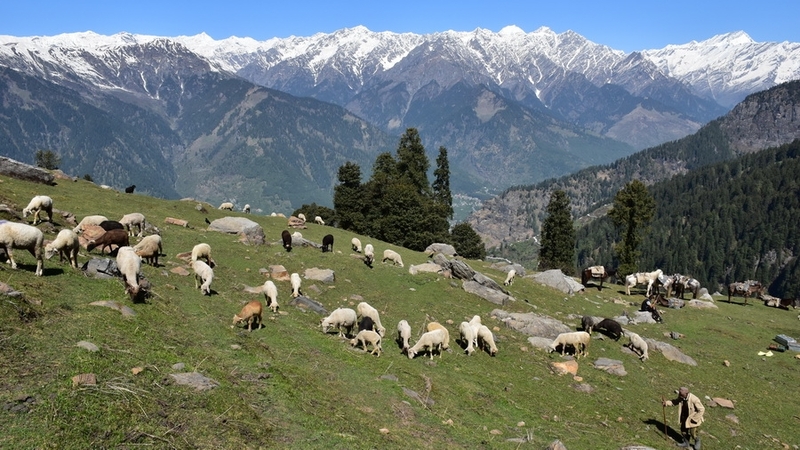 Once it was the old capital of Kullu, is one of the biggest villages in Kullu valley. The main attraction of this village is Shiva temple built in 8th-century in shikara style and also famous for its ancient temples. It is famous for its Chacholi Jatra festival. Continue short drive to Banara village. Starting our trek from Banara at first we start the gentle climb to Nag temple. Located above Jagatsukh village. 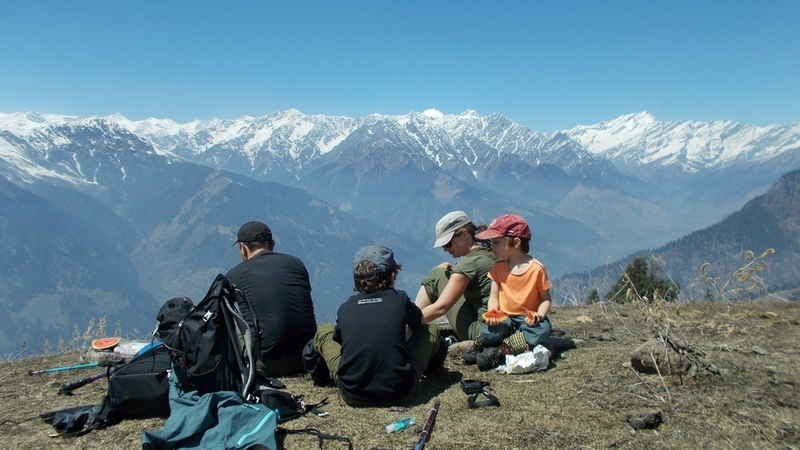 Surrounded by a great view of the upper Kullu valley. We now climb through thickly forest, during summer this trail filled with an abundance of flowers. 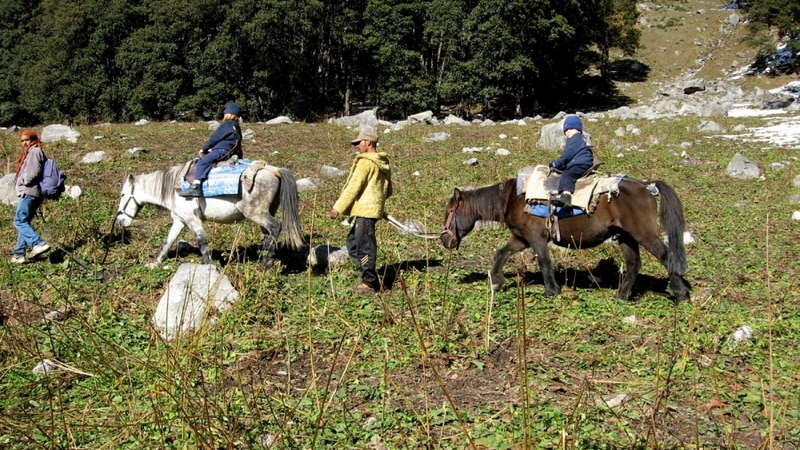 We arrive at lush green meadows of Tilgan Thach, thach- locally means grazing area. Short and gradual ascent to first night campsite at Sarotu. Overnight in camp. 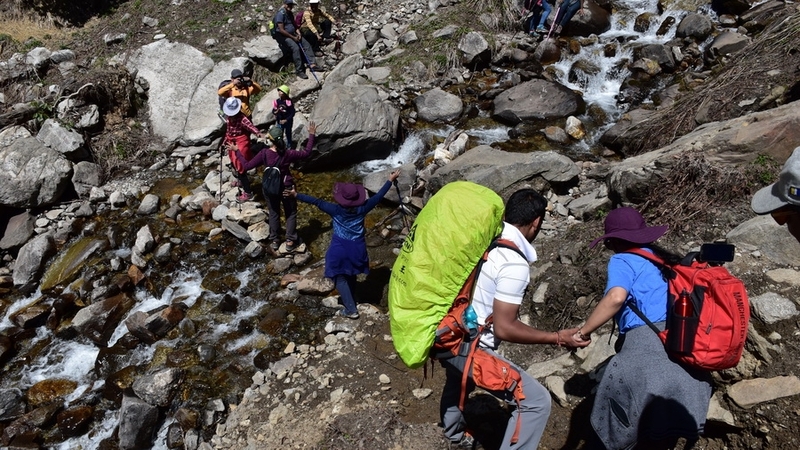 Day 2: Trek to Jogi dug (3200m) - Kharmandiyari / Dumdumini thach 6-7 hrs. Today after breakfast we climb gently on slopes of Hamta. 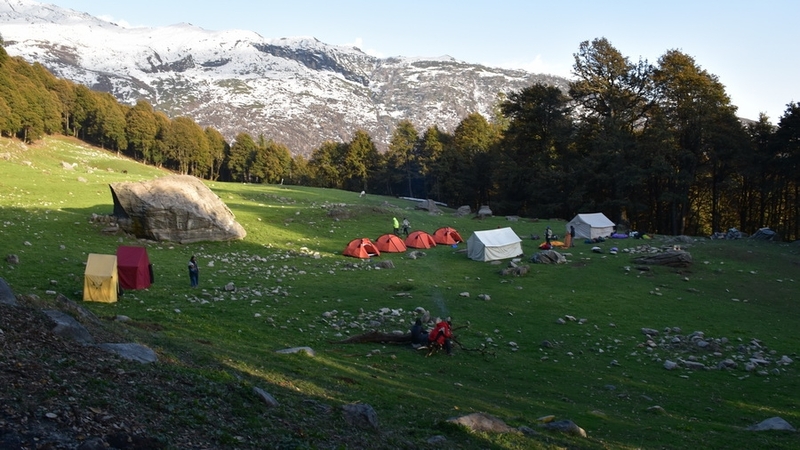 We will arrive at above tree line from where the magnificent view of Pir Panjal range on west side and Brigu Lake Mountains. 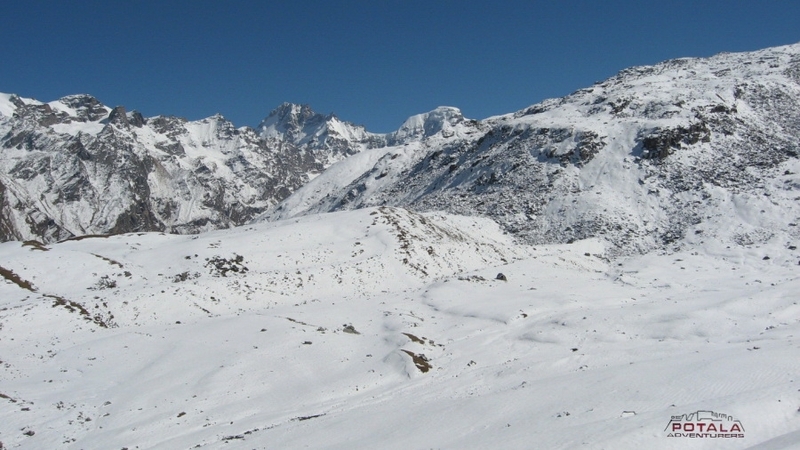 This entire slopes became famous in the world due to one of the best ski slopes in the world. During winter Heli-Skiing is major activities on these hills. Below us lies Sethan village and far main Hamta valley. We climb gently to the campsite of Jogidug. Which is situated above Sethan village. During summer this area is filled with shepherds. It is possible that this day you can climb Sethan dome. To make this early departure from camp is needed. Day 3: Trek to Jobri (2800m) - Chikka (3000m), 5-6 hrs. Today after breakfast the trail crosses over slopes and alpine pasture. 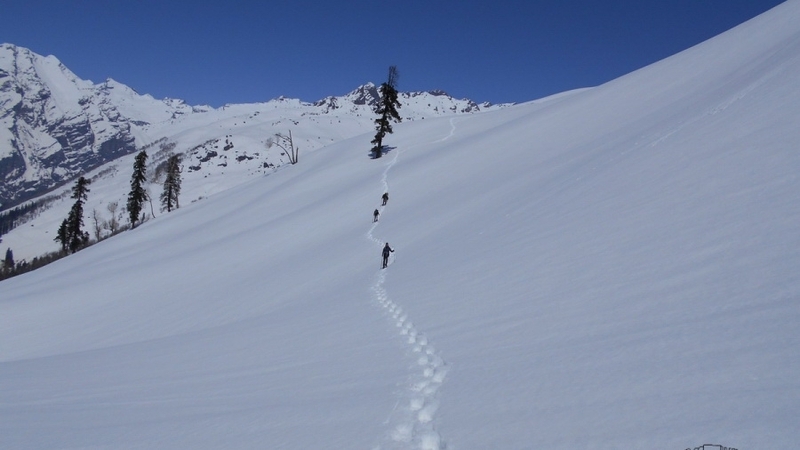 Leaving camp behind easy trail to Jobri which will take only 2 hrs to reach. This part is fully covered with medicinal herbs and plants. After Jobri continues trek to Chikka. The trail goes along the banks of Hamta stream. Enjoy your time near the falls. Leaving Chikka you trek back to Jobri from where the trail goes along the right bank of Hamta stream than later through the lush green forest to a small temple located above Chichoga. Now trail descent gently to Rahni thach. You arrive at above the Japanese temple. 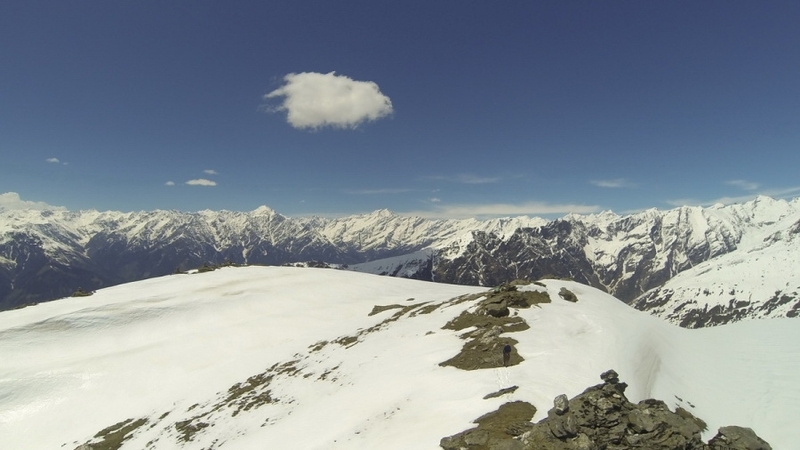 The wide view of Beas river valley and Manali town will remain in sight for a few minutes until reaching Chichoga. 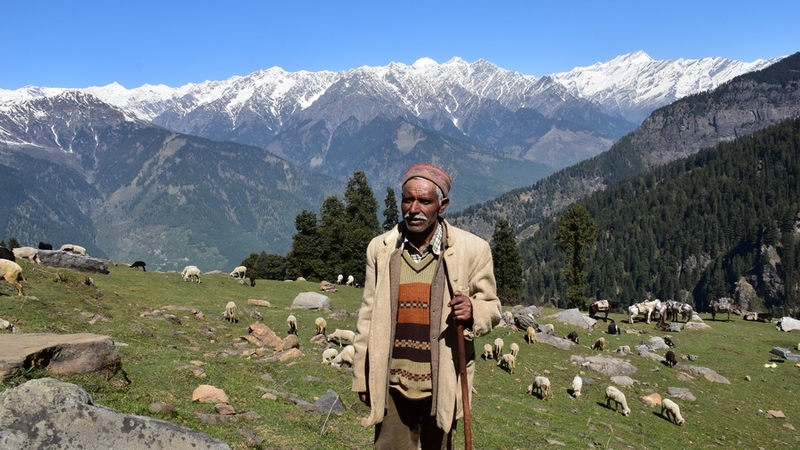 Witnessing the local life at this village, finally, drive to your hotel in Manali. Trip ends. 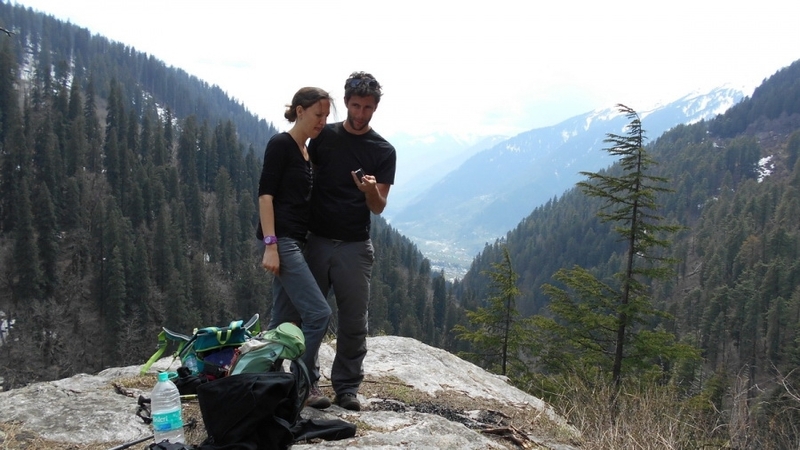 "Ich hatte einen wunderbaren und aussergewoehnlichen Aufenthalt in Manali und einen grossartigen Trek. Prem organisierte zwei tolle Treks fuer mich und beruecksichtigte dabei alle meine Extrawuensche. In der Zwischenzeit konnte ich bei seiner Familie wohnen, welche meinen Aufenthalt noch besser machte. Mein erster Trek war super organisiert mit einem tollen Guide, sehr gutem Essen und einer wunderschoenen Tour. Mein zweiter Trek hat leider nicht geklappt, da ich krank wurde, aber Prems Familie hat sich toll um mich gekuemmert. Nachdem ich wieder fit war, hat Prem mich dafuer auf einige wunderbare Tagesausfluege mitgenommen. Ich habe meine Zeit hier sehr genossen und hoffe für neue Trekkingtouren zurueckzukommen. Vielen Dank fuer alles! 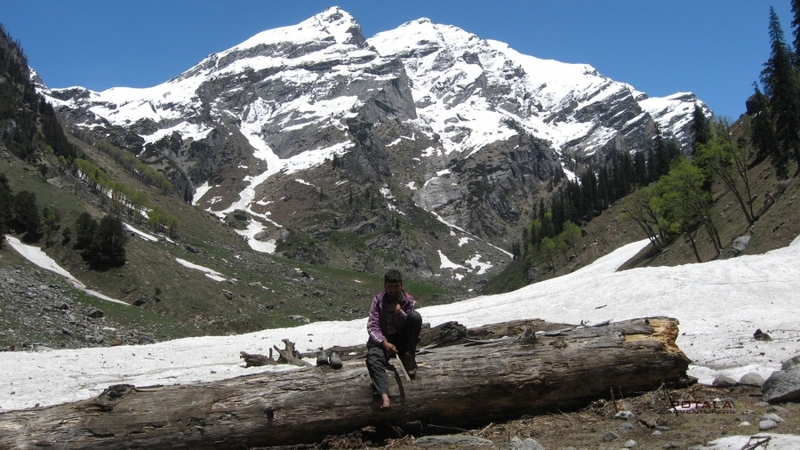 "I had an extraordinary marvelous stay in Manali and a wonderful trek. Prem arranged two great treks for me considering all my extra wishes and in the meantime, I could stay with his family who made my stay even better. 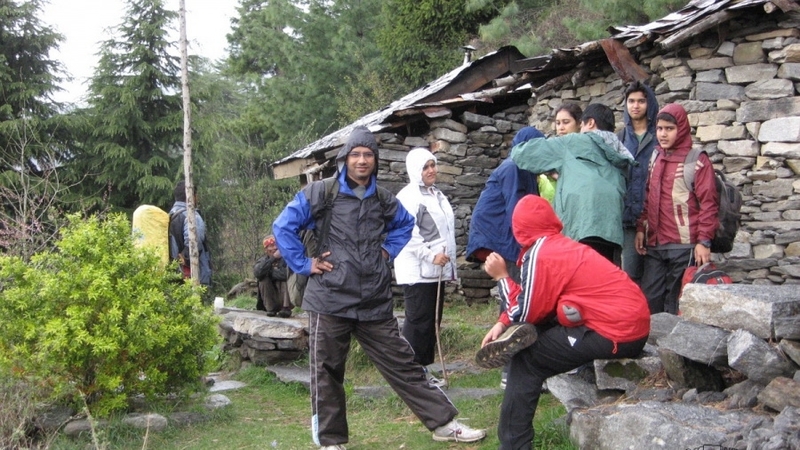 My first trek was super organized with a great guide, very good food, and a beautiful tour. Prem took me on some awesome day trips. I really enjoyed my time here and hope to come back for some more trekking. Thank you very much for everything. 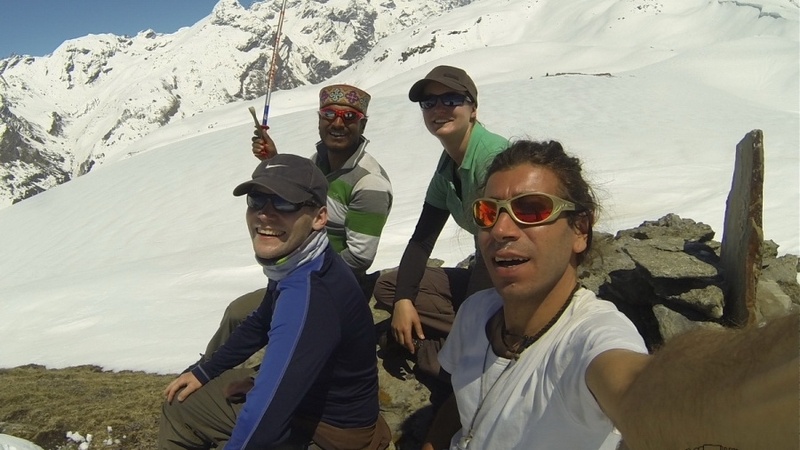 "We had a great 4 days in the Himalaya mountains with Ravinder, that was so patient, guiding careful and interesting guide. The view was amazing, also all the staff was very nice Toni the cooker made very good food and take care of us - very good experienced. Thank you very much." "Very good service and availability. Very good infrastructure, very good food. Ability to adapt to our schedule. 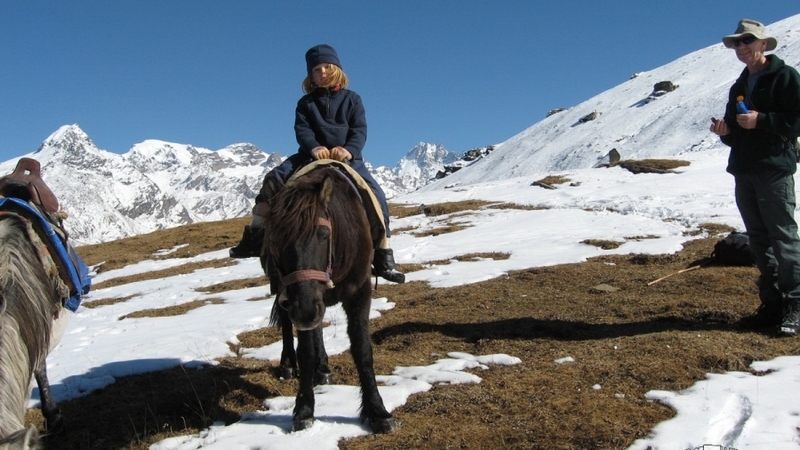 A helpful guide and excellent service at 4000m." 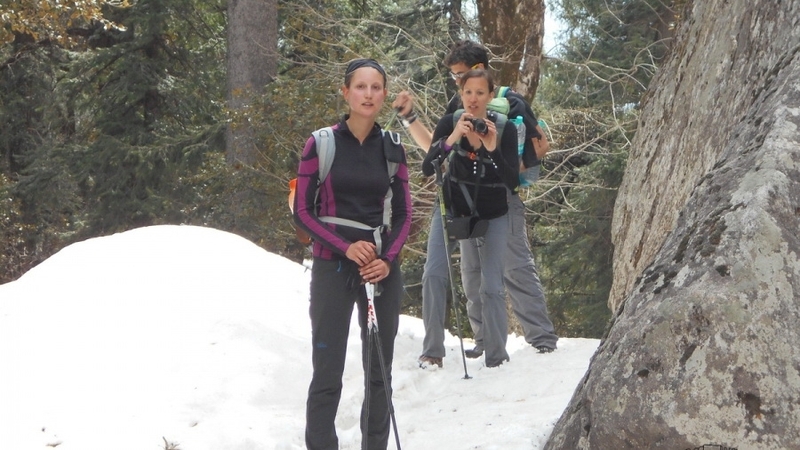 "Trekking with your group is a great experience and fun. Your ambiance is very good. We are happy all the ways. Food is also very good. We will come for some next time with more friends. Thank you. " "The trip was great. Arrangements were very good. Your group took good care of us. Food was very tasty. We will be back soon. Thank you. " I want to specially mention our trek Guide Preetham. He was fantastic. He had all the patience to be with us at all times, helps us through difficult trails and take good care of us in the camp. We enjoyed the food in the camp, the choice of menu and quality of food. 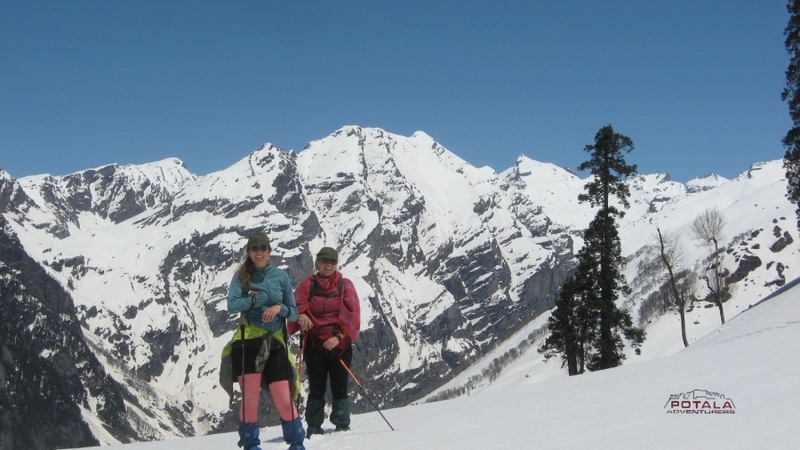 I will definitely call back on you for all our future treks to Manali and Shimla area." " Nice welcoming by Prem and all Potala Adventurers team. We felt in good hands and that we will find the perfect trek for us. 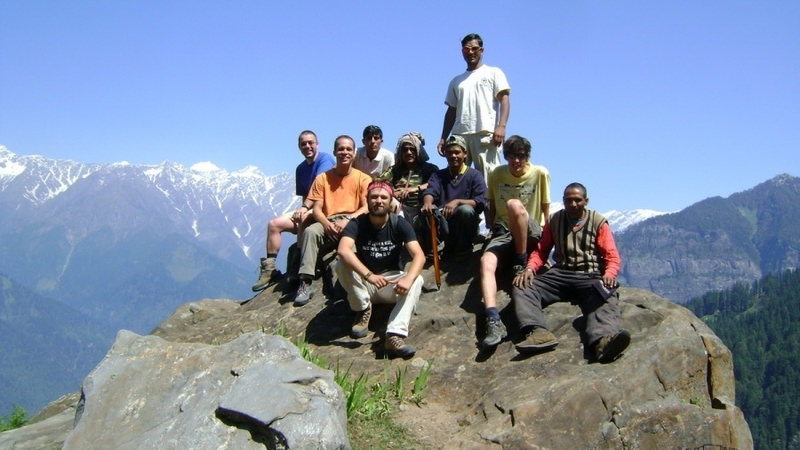 The guide had a lot of skills and knowledge in trekking. Great dynamic, respectful, funny and safe. Porters were also sincerely respectful and helpful. Food: Incredible! Best food in India is on the trek. Sometimes it was too much. We had a wonderful time. We felt safe and was fantastic, breathtaking. The equipment was well adapted. We had time for enjoying a fire and singing song. :-) " - Thanks a lot !!! 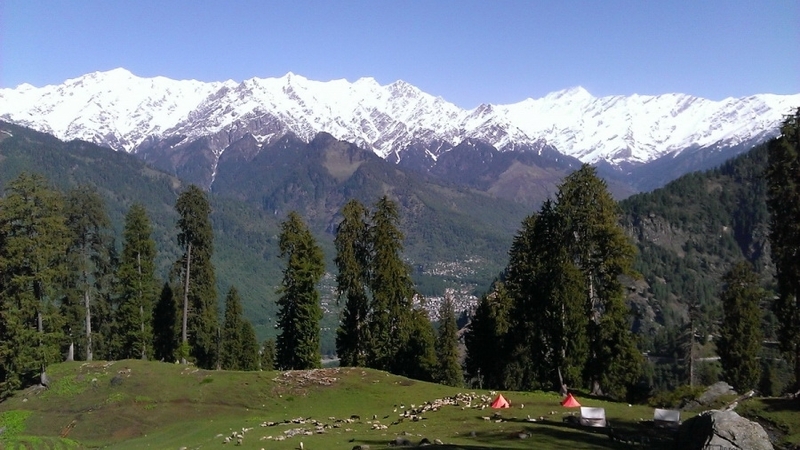 Day 1 Manali 1950m, drive to Jagatsukh (1850m) - Banara (2100m) 9 kms, Trek to Tilgan (2600m) - Sarotu (2980m), 5-6 hrs. 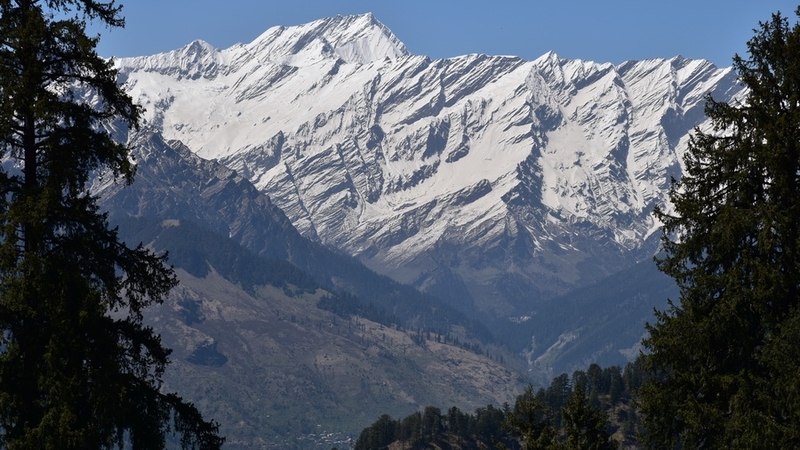 Today leaving Manali drive to Jagatsukh village situated at the distance of 6 kms south of Manali on the left banks of Beas river on Manali – Naggar left bank route. 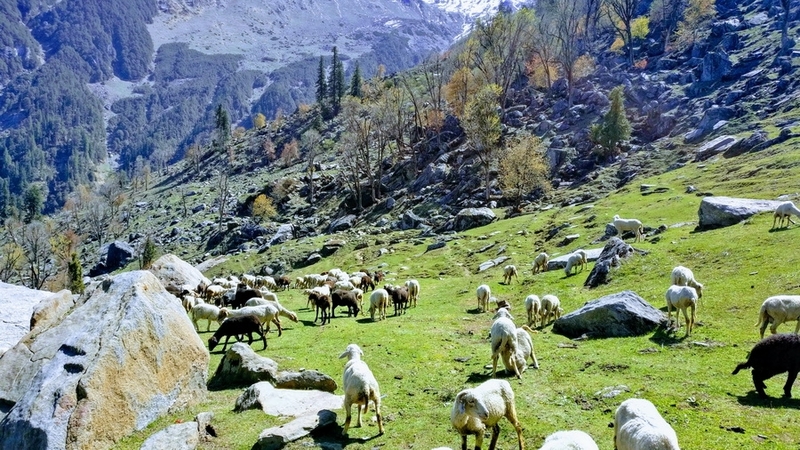 Once it was the old capital of Kullu, is one of the biggest village in Kullu valley. Main attraction of this village is Shiva temple built in 8th century inshikara style and also famous for its ancient temples.It is famous of its Chacholi Jatra festival. Continue short drive to Banara village. Starting our trek from Banara at first we start gentle climb to Nag temple. 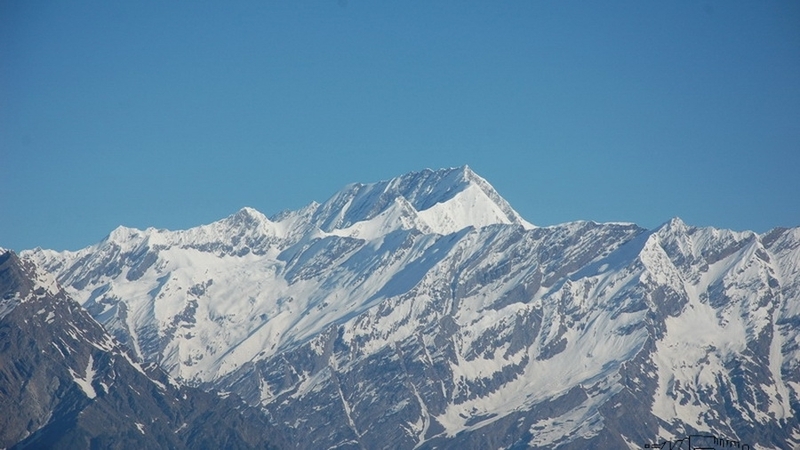 Located above Jagatsukh village. Surrounded by great view of upper Kullu valley. We now climb through thickly forest, during summer this trail filled with abundance of flowers. 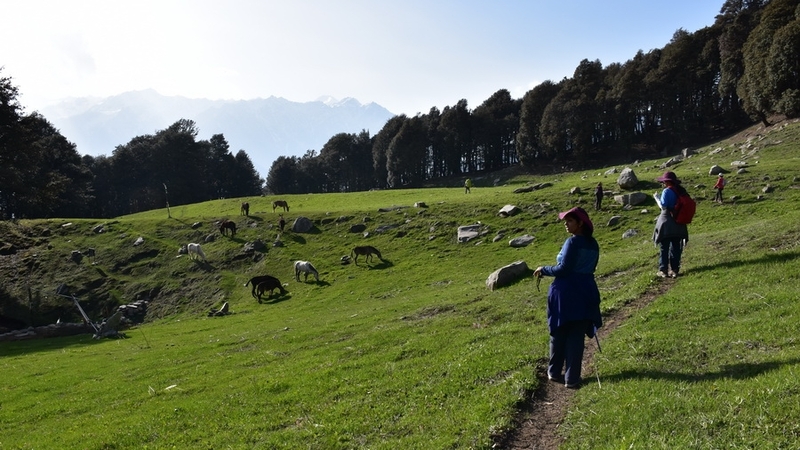 We arrive at lush green meadows of Tilgan Thach, thach- locally means grazing area. Short and gradual ascent to first nigt campsite at Sarotu. Overnight in camp. Day 2 Trek to Jogi dug (3200m) / Dumdumni Thach 6-7 hrs. Today after breakfast we climb gentle on slopes of Hamta. 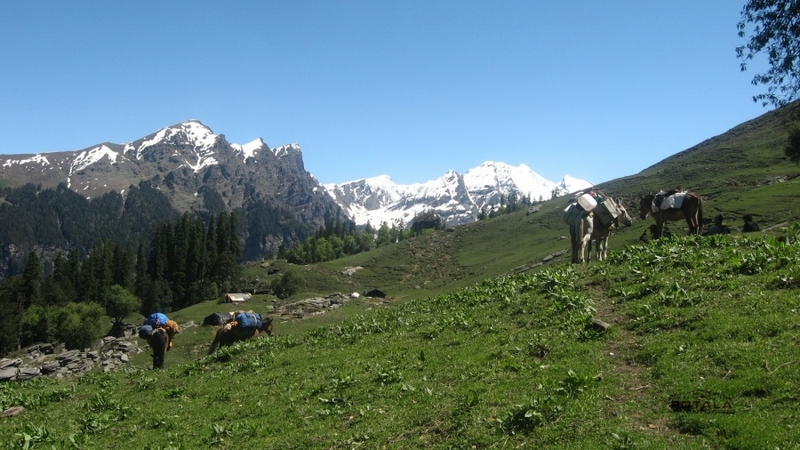 We will arrive at above tree line from where the magnificient view of Pir Panjal range on west side and Brigu Lake Mountains. This entire slopes became famous in world due to one of the best ski slopes in the world. During winter Heli Skiing is major activities on this hills. Below us lies Sethan village and far main Hamta valley. We climb gently to the campsite of Jogidug. Which is situated above Sethan village. During summer this area is filled with shepherds. It is possible that this day you can climb Sethan dome. To make this early departure from camp is needed. 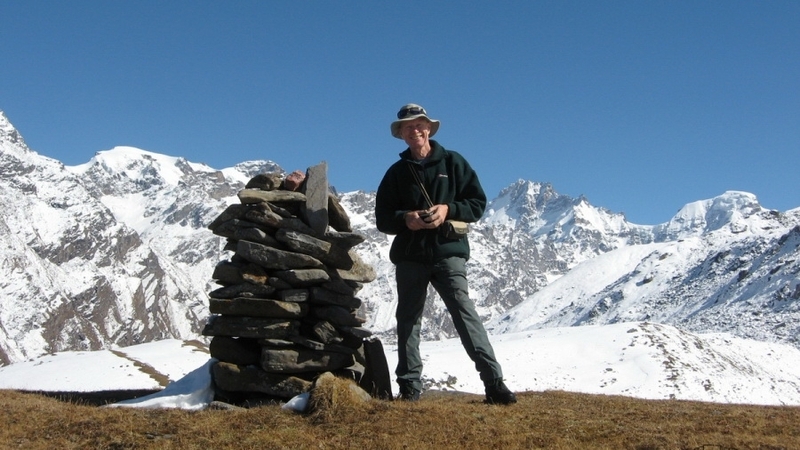 Day 3 Trek to Jobri (2800m) - Chikka (3000m), 6 hrs. Today after breakfast the trail crosses over slopes and alpin pasture. Leaving camp behind easy trail to Jobri which will take only 2 hrs to reach. This part is fully covered with medicinal herbs and plants. After Jobri continue trek to Chikka. The trail goes along the banks of Hamta stream. Enjoy your time near the falls. Leaving Chikka you trek back to Jobri from where trail goes along the right bank of Hamta stream than later through lush green forest to a small temple located above Chichoga. Now trail descent gently to Rahni thach. You arrive at above the Japanese temple. 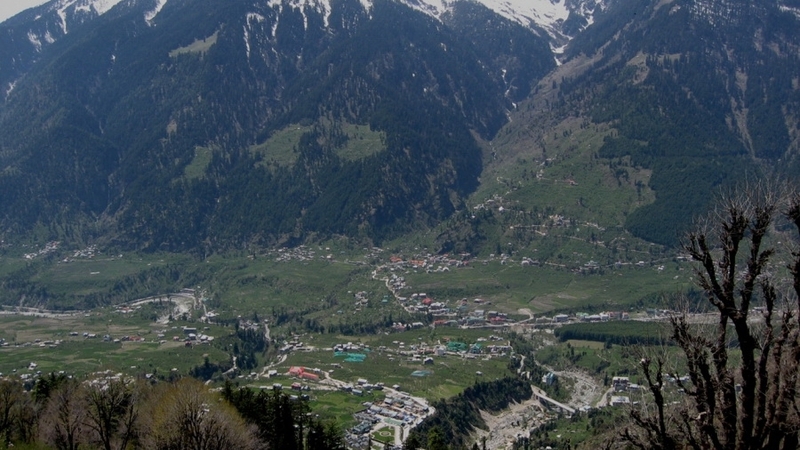 The wide view of Beas river valley and Manali town will remain in sight for few minutes until reaching Chichoga. 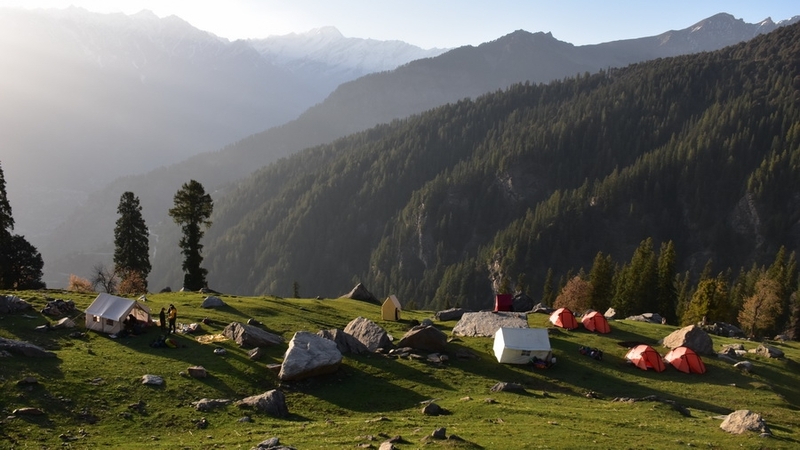 Witnessing the local life at this village, finally drive to your hotel in Manali. Trip ends.